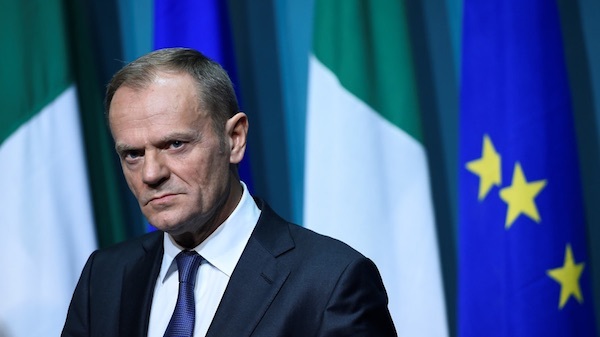 The President of the European Council Donald Tusk has said issues relating to Ireland must be resolved before negotiations on Brexit can move ahead in other matters. Mr Tusk was speaking at a press conference in Dublin following a meeting with the Dublin government. The meeting came after the European Council published draft negotiating guidelines for Brexit earlier this week, in which British prime minister Theresa May’s plan for a ‘cherry-picked’ Brexit relationship were rejected. Tusk said that an impression among some on the British side that other issues on the future relationship between Britain and the EU could be dealt with in advance of talks on Irish issues were wrong. The move increases pressure on the Tory government, which has so far issued its Brexit plans in a sketchy and haphazard manner. It remains dependent on support on the hardline unionist DUP, which has opposed any proposal for the north of Ireland to remain in the EU Customs Union or Single Market. As it stands, without a clear plan for new customs and immigration controls, Britain and the Six Counties are set to fall chaotically out of the European Union within twelve months. In this scenario, Britain has agreed to a “backstop” deal of full regulatory alignment between the two jurisdictions in Ireland, although there have already been indications that this could be reneged upon. Mr Tusk recalled that the Good Friday Agreement, whose 20th anniversary is next month, had been “ratified by huge majorities north and south of the border”. “We must recognise the democratic decision taken by Britain to leave the EU in 2016 - just as we must recognise the democratic decision made on the island of Ireland in 1998 with all its consequences,” he said. The statement was a reference to those made by Brexit supporters regarding the 2016 EU referendum, when a majority in Britain voting to leave, although the North of Ireland voted to remain. In a speech last week, Theresa May agreed that London had “a responsibility to help find a solution” to the border issue. But she reiterated ideas such as “streamlined processes, including a trusted trader scheme” and said they would be “consistent with our commitments”. The EU has said that these ideas are not serious. Tusk said that all EU members were showing solidarity with Ireland during the Brexit process.